Only a fraction of the Earth’s surface contained the right amount of hydrocarbons to trigger the mass extinction, a new study says. Sixty-six million years ago, an enormous asteroid hurtled into Earth, creating an explosion with the force of about 100 trillion tons of TNT. Soot from the ensuing fires, dust and greenhouse gasses spewed into the atmosphere, blocking out the sun and leading to a widespread ecosystem collapse. Some 75 percent of the planet’s species died off, including all non-avian dinosaurs. A new research into the event has determined that the asteroid had little more than a 1-in-10 chance of triggering a mass extinction event when it hit the Earth. Part of the reason the impact as so deadly has to do with where it hit the Earth near the Yucatan Peninsula in Mexico. The scientists say that the location had cast reservoirs of crude oil and hydrocarbons in the shallow sea waiting to be set ablaze. Paleontologist Kunio Kaiho of Tohoku University and Naga Oshima an atmospheric chemist at the Japanese Meteorological Research Institute worked on a previous study that looked at the impact of soot ejected in the atmosphere from organic matter as a reason for the plunging temperatures on Earth and massive extinction event. The new study has found that 60 million years ago, only about 13% of the Earth’s surface had enough organic material to generate the amount of soot needed to kill 75% of life on earth. 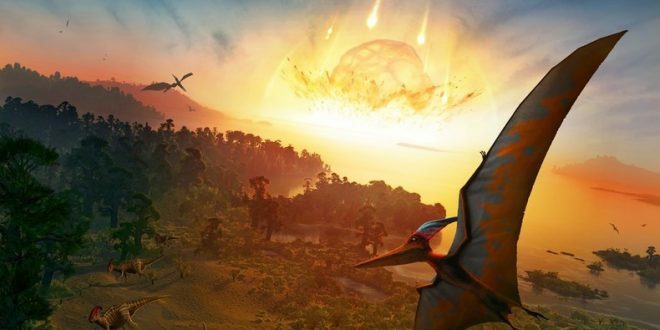 The new study finds that had the asteroid impacted any of that other 87% of Earth, the dinosaurs might still be alive today. Naturally, some scientists disagree. Sean Gulick, a geophysicist from the University of Texas at Austin doesn’t believe that soot was the driver that killed the dinosaurs. Gulick was part of a 2016 drilling project and says that there was little evidence that enough organic material existed at the Chicxulub impact site to support the doomsday soot theory. However, the scientists do agree that the impact location was crucial to the amount of devastation the impact caused. There are several theories as to what events contributed to the mass extinction ranging from acidic oceans to global firestorms, some scientists believe that these global fires caused by hot bits of asteroids raining down across the globe are what created the soot found in clay around the world.